Tony Beeman is a SET veteran (The Doctor, Where No Man Has Gone Before) who rejoins us in the cast of Time’s Arrow. Below, he shares his thoughts on being a part of this truly unique world premiere production. 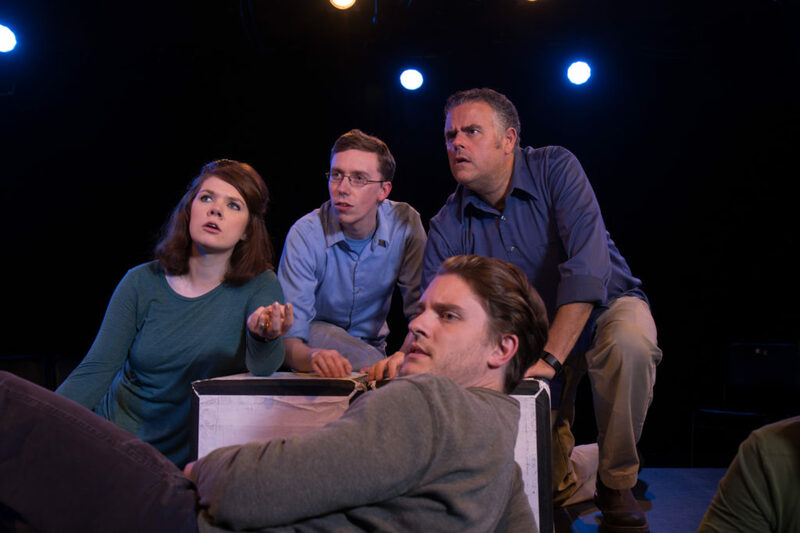 Time’s Arrow runs October 13 – 22 at the Ballard Underground – 6 performances only. Get tickets now at http://timesarrow.bpt.me today! I grew up in East Tennessee, along the Clinch River, where the earth would give up a lot of arrowheads each spring. A friend of the family gave me one of those arrowheads: a quartz arrowhead from the banks of the river, crafted by unknown tribes which had populated the area long before the Shawnee or Cherokee. I remember holding the chipped quartz in my ten-year-old hand and imagining the men and women who must have stood exactly where I was standing all those years ago. How they stood, what they wore, what they were doing. Who they loved. How they lived and how they died. 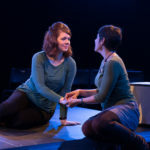 Time’s Arrow, created by director Elizabeth Brammer, and produced by Seattle Experimental Theater, is a show about an arrow of another sort. It opens this Thursday, and of the hundred-some shows I’ve performed in, it’s already among my favorites. 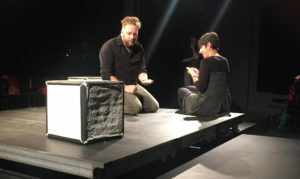 The show explores a fixed place on Earth, while jumping through time. 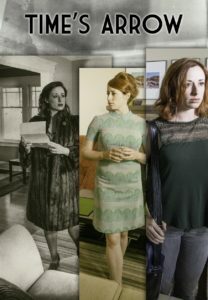 In 1972, a teenager storms out of the dining room, and collapses into a chair that stands where we just watched a 1790’s settler bury her own daughter. In 2173, our descendants argue water as dust sweeps across the landscape. In 1870, two conferderate deserters plan a doomed heist as they hide away in the settler’s now-abandoned shack. Tony Beeman and Sarah Scheller at tech rehearsal for “Time’s Arrow”. We are surrounded by the ghosts of what has been and what will be. And while the characters are unable to break out of that arrow’s path, the audience escapes that velocity, and witnesses the past, present and future simultanously. It’s a sometimes funny, sometimes sad love song to places, with the dusty smell of old bookstores, the lit spark of future possibilities, and the comfortable air of a present that keeps slipping away. We’ve had a great time rehearsing the show, and are incredibly excited to invite an audience to participate in the journey! Time’s Arrow opens Thursday, October 13th, and plays for two weeks on Thursdays, Fridays and Saturdays at the Ballard Underground. Advance tickets available at Brown Paper Tickets.